The action camera records videos by full HD 4K@25fps, 2.7K@30fps 1080P@60fps, 12.0 Megapixels high quality images, 2-Inch TFT LCD screen, you can see what you exactly shoot when you are recording. With a 170 degree Ultra-wide lens, you won't miss out any background details. And it support up to 32GB micro SD card which will let you store all your photos and videos right on the camera. WE EQUIPPED WITH THE CERTIFIED 32GB TF CARD AND FORMAT IT BEFORE USE. 2 inch high definition screen that displays and replays good videos recorded. The Vikeepro sports action camera also comes with a nice set of accessories. 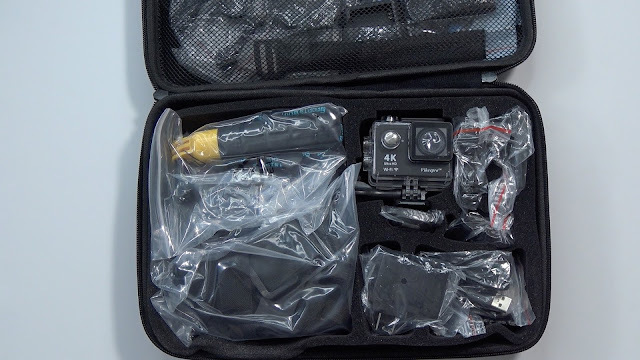 In addition to the waterproof case, you will get helmet mount kit, 7 mounts, 2 clips, one bicycle mount and more, which you could install wherever you want like fixed on your helmet, bicycle, or car for vehicle data recording, photo-shooting, outdoor sports, home security and deep-water probing. If you are a fan of water sports or are interested in making some stunning underwater footage - this waterproof sports action cam is just what you need. You can easily take it snorkeling or even diving with the waterproof case (included in the package) and get to learn more about the underwater world. The waterproof case has to be used while skiing, surfing, boating and other actions which need dustproof or waterproof. WiFi connectivity lets you connect with smart devices without any wires. This WiFi is not only a remote control, it allows you monitor in real-time, review videos/photos on your Smartphone, set camera feature and record modes. What is more, RF remote control, you can wear it on your waist and trigger the camera to take a shot or start recording or even Power On/Off, very useful. Connect the action camera to your computer with a USB cable to transfer your entire library, or simply hook up the sports cam directly to your TV via HDMI. Up to 90 minute video shooting time with the 900mAh battery, 2pcs batteries included in package.